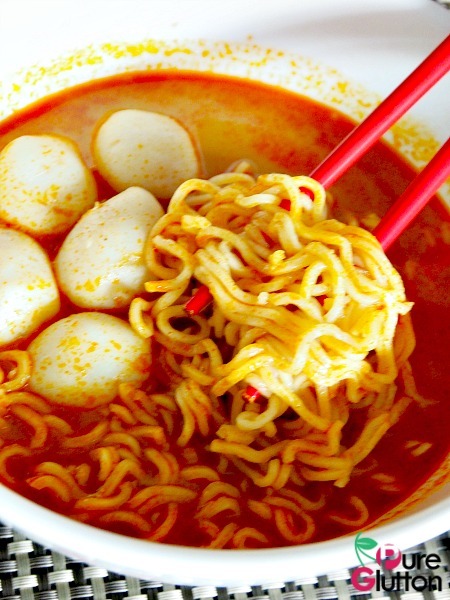 Lately, these instant noodles have been the talk of the town. I’ve seen people raving about it on social media too. Thanks to a fellow blogger friend who passed me some to try not too long ago, I was able to taste them and find out what the fuss is all about. First of all, there’s nothing white about these noodles. 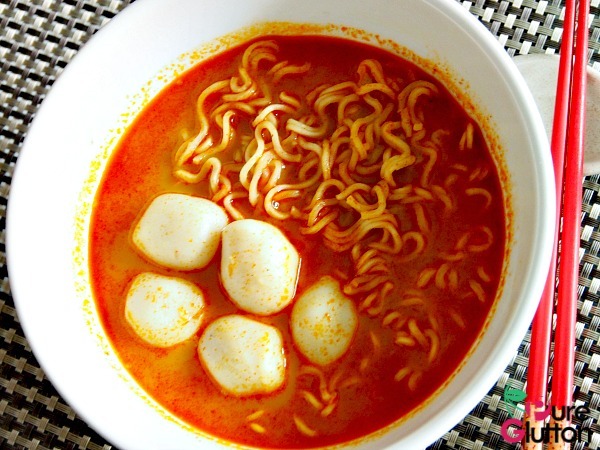 In fact, the curry is much darker and brighter than most other brands of instant curry noodles. 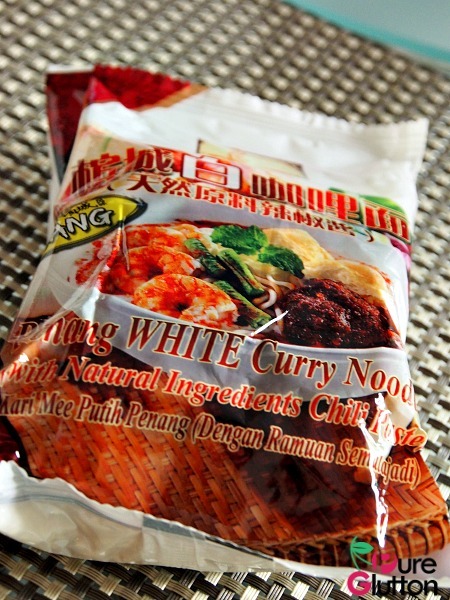 I guess the “white” refers to that particular type of curry noodles that’s popular in Penang. 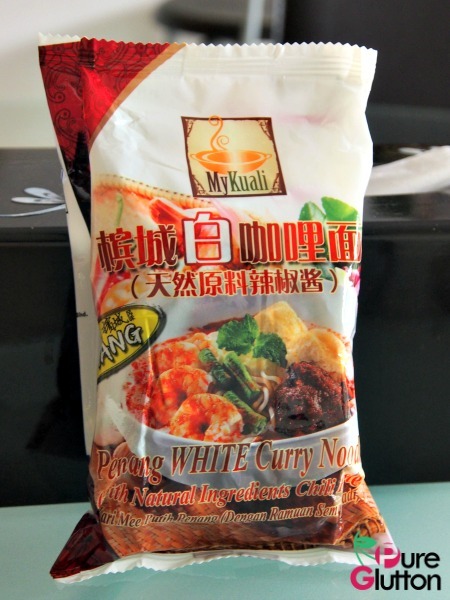 Inside the packet, besides the dry noodles, there are 3 sachets of seasonings: one holding dry powdered seasoning, one with oily curry paste and the last one is powdered coconut creamer. The creamer is the thickening agent, immediately changing the consistency of the curry, making it denser. I find the curry is really packed with deep flavours and the spiciness level (in terms of “spicy” + “hot”) definitely gives a good punch. The noodles are slightly thicker than most other regular brands and give a good bite, provided you don’t overcook them. So, do I like them? You bet I do. For added enjoyment, I dumped in fish balls, prawns and tofu puffs – what’s missing are cockles. Nevertheless, it’s a very welcome snack if you’re too lazy to cook anything more elaborate. The only problem is they’re a pain to buy simply because at the moment, demand far exceeds supply. These are actually meant for the export market. Not many places stock them here in the Klang Valley, although I’ve heard they are available in Sogo Kuala Lumpur and some wet markets but they run out very fast. Even in Penang, where these noodles are manufactured (in Bukit Mertajam actually), people are finding it hard to get them. Many have even resorted to staking out the factory in desperate attempts to get their hands on the noodles. The only way I managed to get a carton of these was through the extensive efforts and connection of a great media friend. The factory price of a carton of 12 packs (4 packets noodles in 1 pack) cost about RM72, so a pack of 4 works out to RM6. Of course, the price in the supermarkets and wet markets is higher than this. I know there are people paying more than RM10 for a pack of 4 as these are bought by “special arrangement” with additional transport charges thrown in. Yes, these are desperate times, people. The publicity created has caused a mad scramble as people hunt everywhere for these noodles. There’s also anger and frustrations when fans have been extremely disappointed running to endless supermarts and still could not get to buy them. In the process, the situation has been taken advantage of, resulting in rocket high prices and yet, people are still willing to pay! I heard the manufacturer is stepping up production and supplies will be more available sometime early next year. Good luck in your noodles hunting then! Ya man…made the soup so creamy! 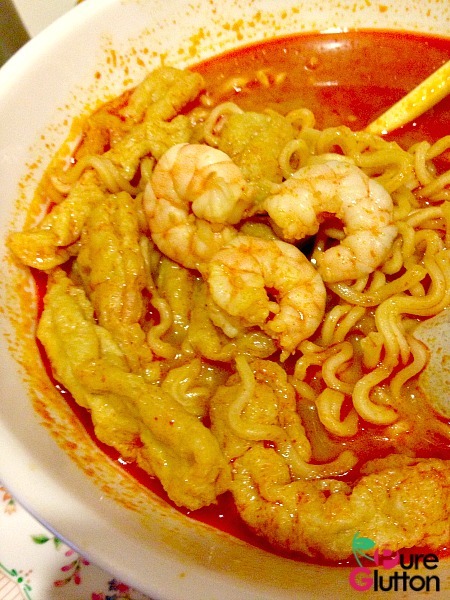 I might just add some santan into my maggie curry! Hahaha…yes, go ahead! May not taste the same as these though! Yes those are fishballs and they are freshly made, not canned. They are more readily available now, I heard.